Aleks Istanbullu’s understanding of the complexity of urban design is inherent in his background. An Armenian born in Istanbul, a city unparalleled cultural and economic diversity, he was educated in the historic cities of Switzerland and studied architecture at the New Bauhaus, Illinois Institute of Technology in Chicago. He began his architectural career in Chicago, one of America’s thoughts, tallest, densest and most rigorously planned cities and later moved to Los Angeles, America’s youthful, sprawling, creative metropolis. In his studio in Santa Monica he as worked for over twenty years in a variety of scales and project types both locally and internationally. His background and training are critical components to his success in building the bridges required to connect things on an urban scale. 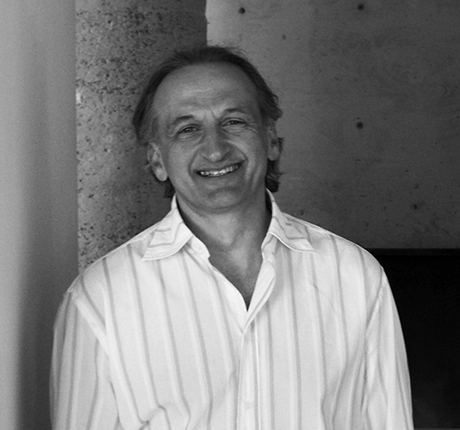 As principal of Aleks Istanbullu Architects he takes a hands-on approach to every project, determined to find and combine elemental and natural concepts. In close collaboration with his team, he then evolves each design into and individual aesthetic and functional whole. This results in buildings that are inherently sustainable and emotionally evocative. A playful and sensuous minimalism combined with an intellectual rigor and conceptual clarity is a hallmark of Aleks’s work. His detailing and choice of materials is elegant and warm, with an emphasis on tactility and color, generating an ongoing dialogue between the building and its inhabitants, within the building itself, and in relation to each building’s context.